Every year since 2002 I have made the pilgrimage to Malibu, California. It has sort of become a family tradition. We load the girls onto a plane or into a car and go off in the wild blue yonder to that place by the sea. For whatever reason Jerry Rushford has graciously asked me to participate in the lectures four or five times now. I think he has been getting desperate since he has asked me … no really it has always been a great honor for me (and has been fun). Hooking up with friends from Japan, Canada, and all over the USA has been a joy. This year I will be traveling by myself but quite a few from Palo Verde will be coming over too. Over the last three years or so 9 pm has become “Late Nite” with Hicks & Valentine. We have spoken on Kingdom Come and A Gathered People and this year we were to speak on a soon to be name subject. Unfortunately John Mark is not going to be able to be there this year but the Late Nite goes on. I will be going solo for the talk and will try to do the subject justice. Our overall theme is “The Struggle for the Soul of Churches of Christ, 1884-1984. Besides taking in the great line up of keynote speakers I hope to learn from Doug Foster, Edward Robinson, Suzy Brown, Tom Olbricht, Danny Dodd and several more. If you are in the area say “hi.” Hope to see you. This entry was posted on Saturday, April 26th, 2008 at 4:41 am	and is filed under Bobby's World, Kingdom, Lectures, Ministry, Preaching. You can follow any responses to this entry through the RSS 2.0 feed. You can leave a response, or trackback from your own site. Wish I could be there. . .
Hope to see you there, Bobby. You’ll be missed while you’re out! Wish I could go. Preach the Word. Enjoyed running into you and the family at Coogie’s last year. 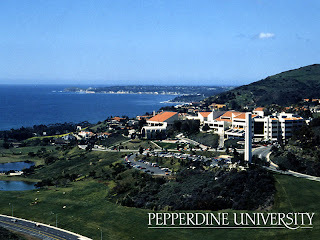 I’m breaking my 19 year streak of attending the Pepperdine Lectures to go on a “Wilderness Trek” with my soon to be graduated from H.S. son this summer. Say hello to Jerry for me. I hope you have a very blessed trip to Pepperdine and home and that God will be with you as you both teach and listen to others. I haven’t commented about it, but really appreciated your words (and those of Danny Dodd and John Mark Hicks) because I, too, went through a horrendous divorce a long time ago, now, after 24 years of marriage and three children. In my case, the local church where I was was particularly vicious, even to the extent of involving my children and trying to turn them against me. Because of that, I not only moved away, but couldn’t go to church anywhere for more than four years. Again, may God richly bless you and your family in your ministry and in all you do. Cheers & Blessings to you all today! Bobby: After 20 consecutive years of attending the lectureship and teaching five of those years (Jerry really does get hard up for teachers! ), I will not be there this year and possibly never again. Bummer. But I hope you have a great week. Steve Puckett spent the weekend with us and asked if I’d read your blog lately. Honestly, I read it but when you said you were divorced, I just took it that at some point in your life you had been divorced. I had no idea it was recent! My heart goes out to you and your family! Have safe and fun trip brother! Have a great trip, also, Have you read “Making a Meal of It.” I just read it this week. Best of luck on your trip. I will see if I can head out that way next year. Sounds like it would be very enlightening. You did an outstanding job last night. Hope to see you there tonight. I’m sorry I didn’t have time to come up and speak last night. The 9:00 PM class was great! Glad we were there to hear all about the Volunteers and the Longhorns. I hope you were blessed during the trip as well.